The Congress and Khilafat movement was organized in massive proportion in the Malabar district of Kerala. The majority of population of most of the Talukas of that district were Mopla Muslims. They were mostly poor peasants or Jenmis (Bonded labour) while the landlords were mostly Hindus. Before 1921, the British rulers had almost always turned the anger of Mopla peasants into communal lines and defeated them. This time Mahatma Gandhi and Maulana Saukat Ali jointly toured Kerala and propagated for Swaraj and Khilafat. The response was tremendous and Khilafat committees were formed almost everywhere. In August, 1921, the police issued rule 144 in the two Talukas of Ernad and Valluvamad, because these two were strongholds of the Moplas. The police also tried to arrest on 20th August 1921, the Secretary of the Ernad Khilafat Committee. The Moplas resisted this arrest with swords and spears. Led by the Police Superintendent of Ernad, a huge police party forcibly entered the Tirurangadi Masjid. At once, the protest movement spread like wild fire and took the character of a mass rebellion. The Moplas captured police thanas one after another, looted Government treasury and burnt official documents in the courts and the Registry offices. Led by desperate rebel leaders like Ali Musaliar, the Mopla rebellion took unprecedented form. According to historians of the Congress movement in Kerala by 28th August, 1921, the British rule totally collapsed in the areas of Malappuras, Tirurangadi, Sazeri and Perinthalmanna. Historian Roland Miller wrote that while British controlled the main cities, the entire rural area of Malabar was completely controlled by the Mopla rebels for 3 whole months. More than a million people in 220 sub districts were involved in this mass uprising. The British Government invoked Marshal Law to crush the rebellion. Then started the reign of terror. An instance is the episode of 19th November, 1921. On that day in a small compartment of a train, 122 Moplas were packed like Sardines and were taken to Coimbatore, 90 miles away. At Coimbatore, when the doors of the compartment were opened, it was found that 64 prisoners had been suffocated to death. All told at least 10,000 Moplas were killed in the name of crushing down the rebellion and 3,000 more were sentenced to transportation for life and shipped off to the Andamans. Except the revolt of 1857 and the Santhal revolt prior to that so many people had never been killed by the British in any other single movement. Many Hindus had also participated in the Mopla rebellion. No Hindu leader or even leaders of the joint movement were allowed to enter the area during the rebellion. 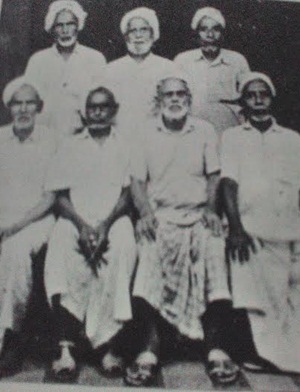 Among the 1st 46 Mopla rebels given life sentences, side by side with Maid Maulavi, Mahammad Abdul Rahman and Hassan Koya were one Namboodri, one Menon, one Nayar and Narayan Menon, Madhaba Nabi.